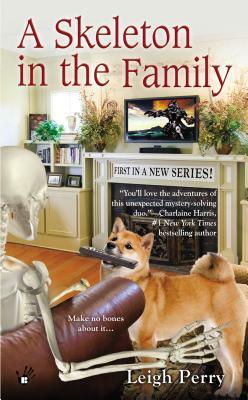 A Skeleton in the Family (A Family Skeleton Mystery #1) (Mass Market) | Eagle Harbor Book Co. This is the first in a series, yet stands on its own. It’s a cozy little mystery set in and around a college campus, and one of the main characters happens to be a perfectly well-mannered skeleton who sets out to solve his own decades-past murder and find answers about his identity with the help of his best friend, a mild-mannered English teacher. The plot kept me interested, and though I didn’t manage to predict the end, in retrospect, all the pieces were there. It was genuinely fun to read, difficult to put down, and perfectly sized for an afternoon's reading. Moving back into her parents’ house with her teenage daughter had not been Georgia Thackery’s “Plan A.” But when she got a job at the local college, it seemed the sensible thing to do. So she settled in and began reconnecting with old friends. Sid walks, he talks, he makes bad jokes, he tries to keep Georgia’s dog from considering him a snack. And he manages to persuade Georgia to let him leave the house. But when she takes him to an anime convention—disguised as a skeleton, of course—he sees a woman who triggers memories of his past. Leigh Perry is a pseudonym for Toni L.P. Kelner, who is an award-winning mystery author, and the co-editor, with Charlaine Harris, of a series of New York Times bestselling fantasy-mystery anthologies, including Many Bloody Returns; Wolfsbane & Mistletoe; Death's Excellent Vacation; An Apple for the Creature, and Home Improvement: Undead Edition. "Dr. Georgia Thackery is smart, resourceful, and determined to be a great single mom to her teenager. Georgia is normal in every respect—except that her best friend happens to be a skeleton named Sid. You'll love the adventures of this unexpected mystery-solving duo. "—#1 New York Times bestselling author Charlaine Harris.